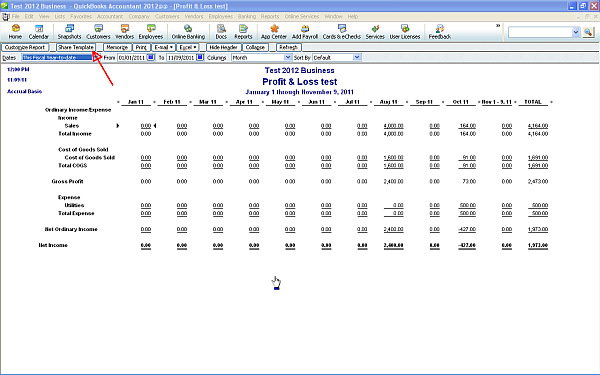 In QuickBooks® 2012 Pro and above the contributed reports have been improved. The big improvement is that you can now access report templates contributed by other users. You can also share your favorite reports with other users. This could save you time by not reinventing the wheel if you want a more complex report that is not one of the QuickBooks® standards. To access the contributed reports either click on Reports | Contributed Reports then select the category of report you want or click on Reports | Report Center then click on the Contributed tab. You will see the following screen. 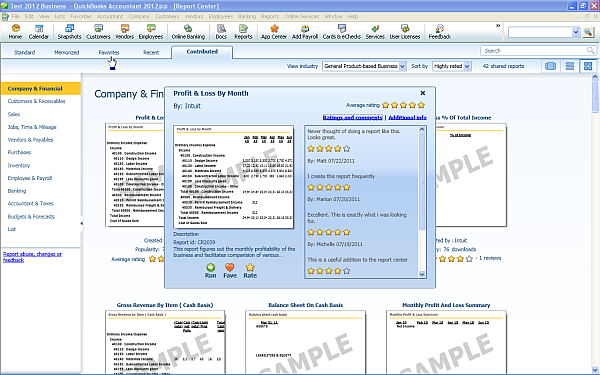 On the left hand side you can choose what type of report you are looking for. At the top you can filter by type of industry and sort by rating, popularity, or who created the report. If you hover over each report you can click on run to run the report on your data. You can then memorize the report to save it on your machine. Clicking on info brings up more information about the report and the chance to see the reviews. You can also click on the Fave icon to add the report to your favorites in the Report Center. If you create a report that you would like to share with other QuickBooks® users you can do this by clicking on the Share Template button at the top of the report screen. This will bring up the following screen where you can enter information about your report such as details about what the report does and if it applies to any specific industry. 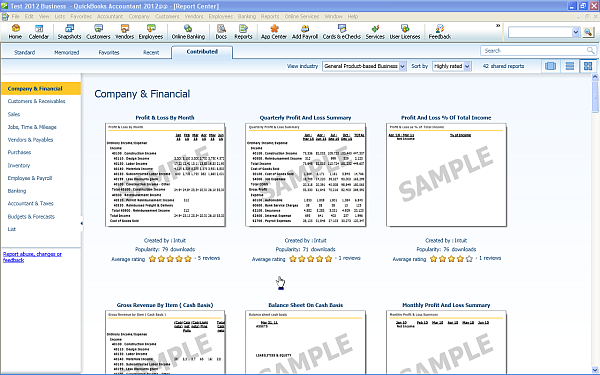 In summary this is a useful improvement to QuickBooks® and will save time if you need a more complex report. If you are unable to find a suitable report we can assist you with creating custom QuickBooks® reports for your business. Call us on (480) 363-4808 or email us. 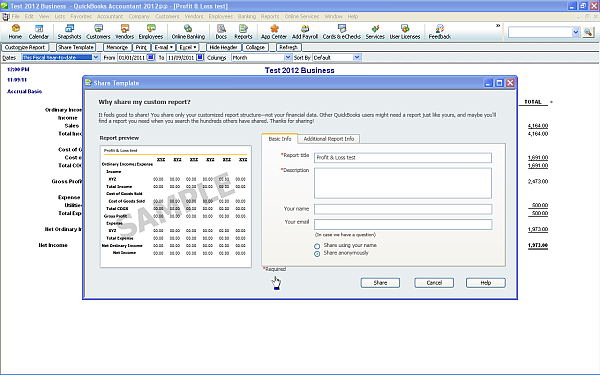 This entry was posted in Accounting Tips and tagged Contributed Reports, QuickBooks 2012, QuickBooks Premier, QuickBooks Pro, QuickBooks reports. Bookmark the permalink.